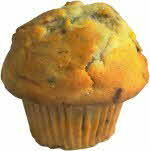 • Tops are peaked and not rounded: Muffins were baked too long or at too high a temperature. • Muffin is excessively shrunken or dry: Too little batter was placed in the tin; or, muffins were baked too long or at too high a temperature. • Muffin texture (inside grain) has tunnels: Batter was over-mixed. In addition, oven or batter temperature may have been too high. • Texture is soggy: Batter was over-mixed or muffin was under-baked. • Tops are flat and smooth: Oven temperature was too low; not enough batter was placed in the tin; or muffins were baked in paper liners. • Crust is too light: Muffins have been underbaked or baked at too low a temperature.